Rose Coconut Barfi is elegant and simplistic against the riot of colours as the Navratri festival begins. These glorious fudge, coconut flavoured with delicate fragrance rose are just divine! Rich and creamy squares are perfect to indulge during any fasting and festive season, also a great choice for prasad . A festive mood has gripped everyone as we all want to celebrate Navratri, one of the most popular Hindu festival dedicated to the worship of Goddess Durga, a much awaited festival throughout the year. Navratri is celebrated for nine nights and ten days, and people worship the nine forms of Maa Durga. Although there are altogether five types of Navratris celebrated throughout the year but Sharad Navratri which falls during Autumn ( September-October ) is celebrated with more fervour and excitement than the others. People through out India have their unique way of celebrating this festival and has special significance and most awaited festival in Gujarati community, however the dedication and devotion remains the same for every community. Idol of Goddess Durga is worshipped by everyone and try to enhance their spiritual, mental and physical practise in these nine days. These nine days celebrates motherhood of god and involves three worship of the three forms of devi or divine mothers Goddess Durga, Laxmi and Saraswati . The first three days dedicated and worshipped Goddess Durga, who triumphed over the demon after a battle of nine days and who wipes away the away the negativity. The next three days are made to venerated Laxmi, Goddess of wealth, fortune and prosperity and the last three days involves the worship of Sarsawati, Goddess of knowledge. During this magical festive season, various type of Prasad ( offering ) offered everyday to nine goddesses as it is believed that all the fasts and festivals are incomplete without offering prasad or Bhog. So to celebrate on this auspicious Navratri, I am sharing a recipe of Rose Coconut Barfi . I am sure you're going to love this recipe, simplicity is the ultimate sophistication ! Try it out my these other eight delectable prasad recipes in your kitchen and make this festival more divine and grand ! Grease plate or tray with little ghee, leave it aside. Heat ghee in a non stick or heavy bottom kadai. Add coconut and lightly roast without burning for 2-3 minutes. Remove it from the kadai. In same kadai add milk and sugar. Bring it to boil and let the sugar dissolve. Now add roasted coconut and khoya. Combine everything and let the mixture cook. Keep stirring continuously without burning or sticking to the bottom of the pan. Once mixture gets thickened, turn off the heat and remove the pan or kadai from the stove. Add rose extract and mix well. Pour the barfi mixture into greased tray and spread evenly. Press gently with clear spatula and leave it to cool completely. Cut into desire shape and garnish it with the edible rose petals. WOW! That looks simply divine! I love how delicate each piece looks! Sounds delightful. This would make a lovely holiday gift. Rose and coconut sound so delicate and amazing. These look so delicious! Anything with coconut sounds good to me! This looks sensational! 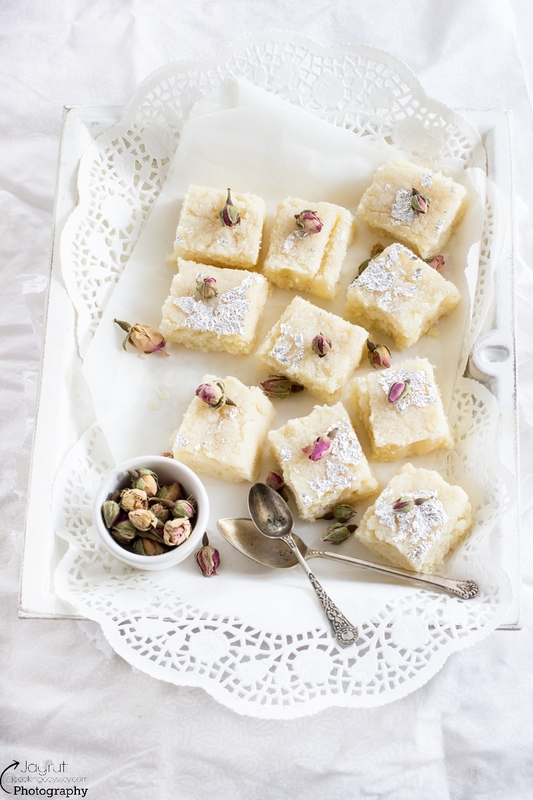 I love coconut flavoured desserts and the addition of rose sounds so wonderful! Thanks for sharing this recipe. I love coconut and these look amazing! These look and sound like a wonder new fudge to make. Thank you! These little bars looks so light and delicious. I love anything coconut so I can't wait to try. 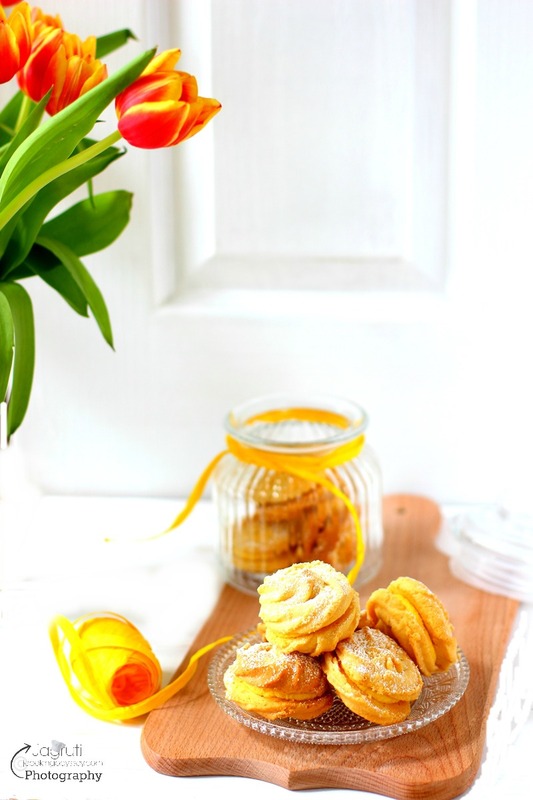 Another amazing sweet on your blog!! Love the garnishing with tiny roses 🌹. Is rose extract the same as rose water? Or is it a type of oil? No it's just like a vanilla essence, comes in a very small bottle. Barfi looks Divine.. and so is the presentations .. as always. 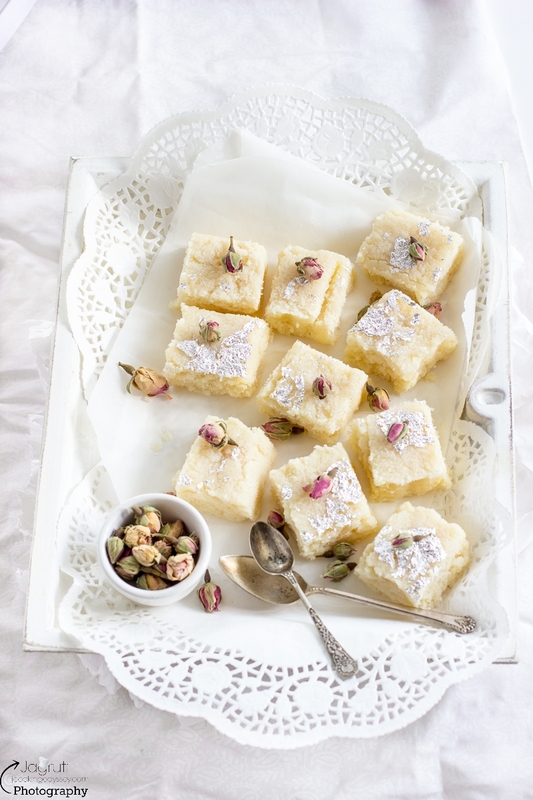 Coconut and rose combo burfi sounds amazing. I am sure the rose extract adds exotic flavour to the burfi along with strong aroma of the coconut. Clicks are just irresistible. Barfi looks super tempting.Coconut and rose combo sounds amazing. Exotic flavour of rose extract along with nutty aroma of coconut must have lent multiple layers of flavours to this barfi. Wow, what an exotic flavor to burfis, i ould have never imagine adding rose extract in burfi, very brilliant idea Jags. Wish i get a box of this burfis from you. Omg, cant take my eye off from those beauties. 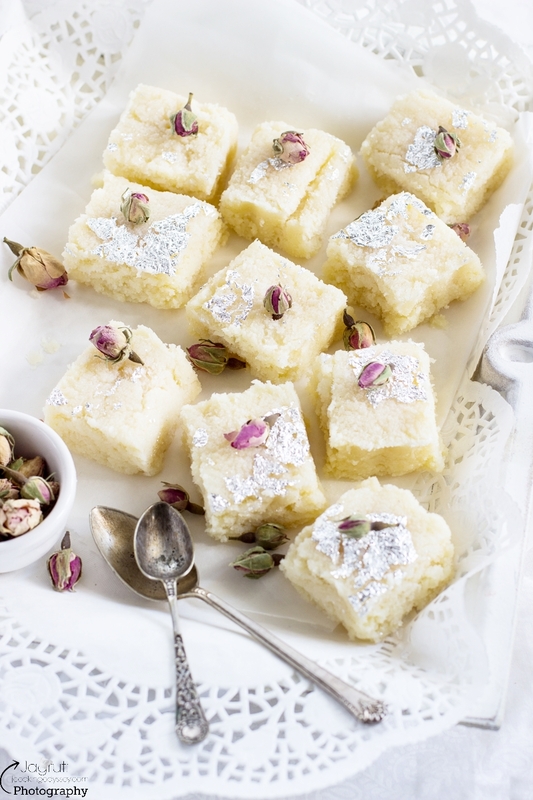 Coconut barfi itself is such an indulgence, and the addition of rose must have taken it to new exotic heights. Gorgeous pictures! I feel the cup that you have placed the BArfi in says it aptly "gorgeous" I wil want to try this for my daughter birthday may be. This looks so yum, lovely and delicious. Loved your click as always. 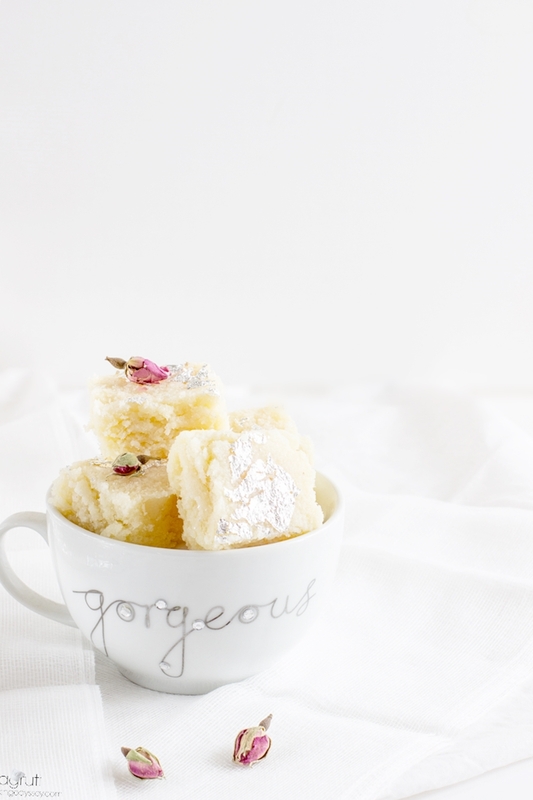 The "Gorgeous Barfi" in Gorgeous cup. I love this fudge, You gave an additional exotic flavor "Rose". It's so irresistible. 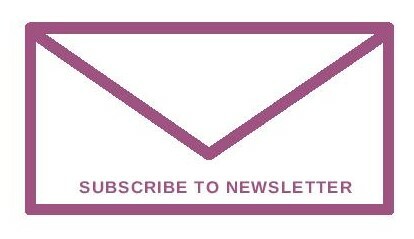 Your clicks are awesome as usual. Aaaah soft coconut burfis that to with rose flavours, just too good, want to dig my teeth in one of them , craving for them after seeing your lovely photos, awsome share. coconut barfi looking so drooling, will try it with khoya. Clicks came out superb, rose flavor coconut barfi itself sounds tempting. Beautiful share. The coconut and rose combination in a fudge sounds really delectable ..the fudge looks perfect and your presentation makes it all the more inviting ! The combination is super yum !!!! A wonderful and flavouful treat Jagruti. Rose and coconut make a delightful combination.Your clciks are making it even more tempting. Stunning captures.Beautifully styled.. Love this Barfi. Anything with coconut and I am sold . So many childhood memories got refresh with this post. Thanks a lot for sharing..
Coconut burfi looks so delectable and easy to make too. Its on my to do list now.